I love smoothies and I love mixing different fruits and superfoods to create delicious smoothies. I love drinking my smoothies out of nice margarita glasses or cute mason jars. Today was different though….I saw the “smoothie bowl” on the internet and wondered what the allure was. So I grabbed my Vitamix, fruits and various other healthy ingredients in my cabinet and got to work. After I poured the smoothie into my bowl, I cut the strawberries and bananas and delicately placed them on top of the smoothie. I then placed the blueberries and goji berries, scattered some oats and finally sprinkled the chia seeds. And…..voila! I made my first smoothie bowl. Rather than just quickly drinking down my usual smoothie, this one was different. It took time and patience to place my toppings just so, and I truly enjoyed that. It allowed me to slow down and become mindful of what was going to nourish my body as I placed each spoonful in my mouth. I enjoyed making my first smoothie bowl and I can’t wait to experiment with more combinations! 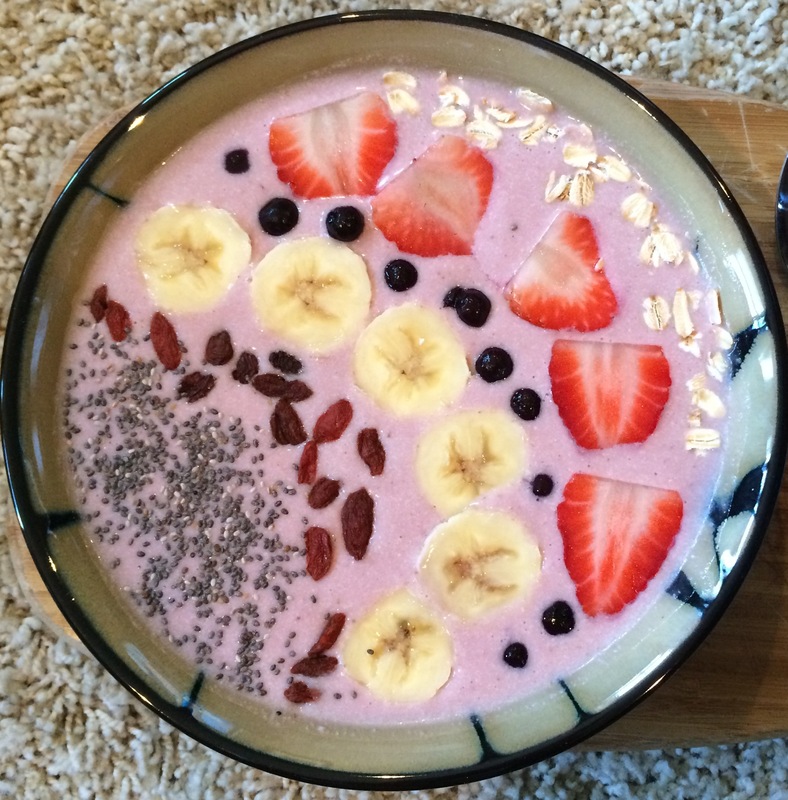 If you are new to smoothie bowls, give this one a try and then create your own! Mix all ingredients in your Vitamix or blender until smooth. Pour into a bowl and then delicately place your toppings! Eat with a spoon slowly, and enjoy!